For the old Kurdish shepherd, it was just another burning hot day in the rolling plains of eastern Turkey. Following his flock over the arid hillsides, he passed the single mulberry tree, which the locals regarded as 'sacred'. The bells on his sheep tinkled in the stillness. Then he spotted something. Crouching down, he brushed away the dust, and exposed a strange, large, oblong stone. The man looked left and right: there were similar stone rectangles, peeping from the sands. Calling his dog to heel, the shepherd resolved to inform someone of his finds when he got back to the village. Maybe the stones were important. A few weeks after his discovery, news of the shepherd's find reached museum curators in the ancient city of Sanliurfa, ten miles south-west of the stones. They got in touch with the German Archaeological Institute in Istanbul. And so, in late 1994, archaeologist Klaus Schmidt came to the site of Gobekli Tepe (pronounced Go-beckly Tepp-ay) to begin his excavations. Schmidt stayed. And what he has uncovered is astonishing. 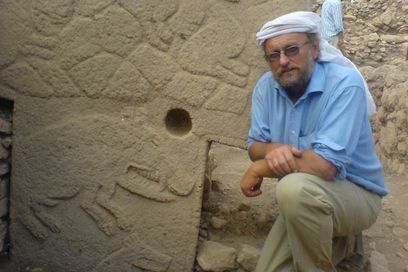 Archaeologists worldwide are in rare agreement on the site's importance. 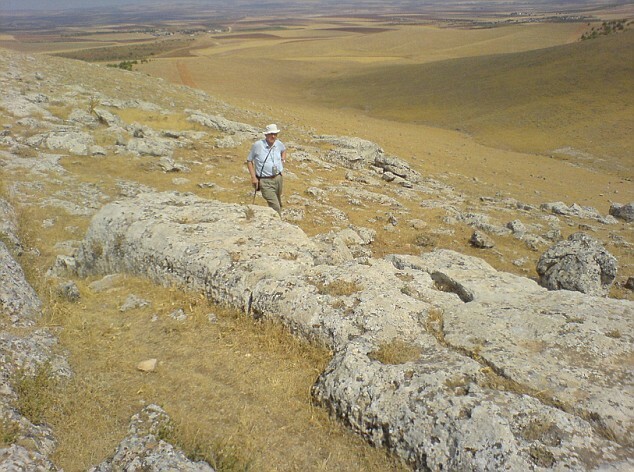 'Gobekli Tepe changes everything,' says Ian Hodder, at Stanford University. So what is it that has energised and astounded the sober world of academia? The site of Gobekli Tepe is simple enough to describe. The oblong stones, unearthed by the shepherd, turned out to be the flat tops of awesome, T-shaped megaliths. Imagine carved and slender versions of the stones of Avebury or Stonehenge. Most of these standing stones are inscribed with bizarre and delicate images - mainly of boars and ducks, of hunting and game. Sinuous serpents are another common motif. Some of the megaliths show crayfish or lions. The stones seem to represent human forms - some have stylised 'arms', which angle down the sides. Functionally, the site appears to be a temple, or ritual site, like the stone circles of Western Europe. To date, 45 of these stones have been dug out - they are arranged in circles from five to ten yards across - but there are indications that much more is to come. Geomagnetic surveys imply that there are hundreds more standing stones, just waiting to be excavated. So far, so remarkable. If Gobekli Tepe was simply this, it would already be a dazzling site - a Turkish Stonehenge. 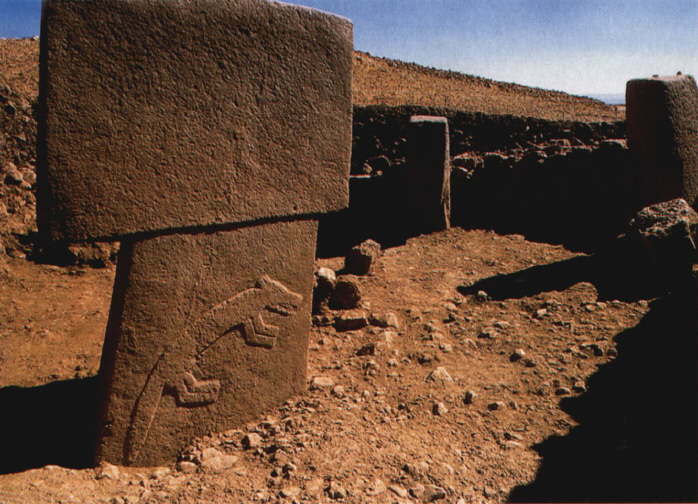 But several unique factors lift Gobekli Tepe into the archaeological stratosphere - and the realms of the fantastical. 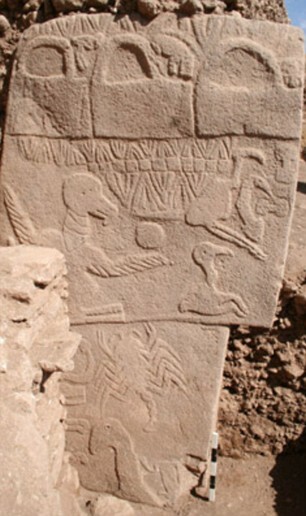 The Garden of Eden come to life: Is Gobekli Tepe where the story began? How did cavemen build something so ambitious? Schmidt speculates that bands of hunters would have gathered sporadically at the site, through the decades of construction, living in animal-skin tents, slaughtering local game for food. The many flint arrowheads found around Gobekli support this thesis; they also support the dating of the site. This revelation, that Stone Age hunter-gatherers could have built something like Gobekli, is worldchanging, for it shows that the old hunter-gatherer life, in this region of Turkey, was far more advanced than we ever conceived - almost unbelievably sophisticated. It's as if the gods came down from heaven and built Gobekli for themselves. 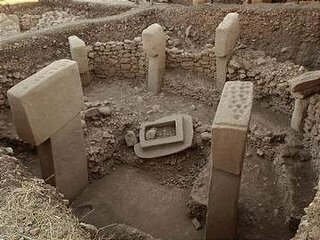 This is where we come to the biblical connection, and my own involvement in the Gobekli Tepe story. About three years ago, intrigued by the first scant details of the site, I flew out to Gobekli. It was a long, wearying journey, but more than worth it, not least as it would later provide the backdrop for a new novel I have written. Back then, on the day I arrived at the dig, the archaeologists were unearthing mind-blowing artworks. As these sculptures were revealed, I realised that I was among the first people to see them since the end of the Ice Age. To understand how a respected academic like Schmidt can make such a dizzying claim, you need to know that many scholars view the Eden story as folk-memory, or allegory. 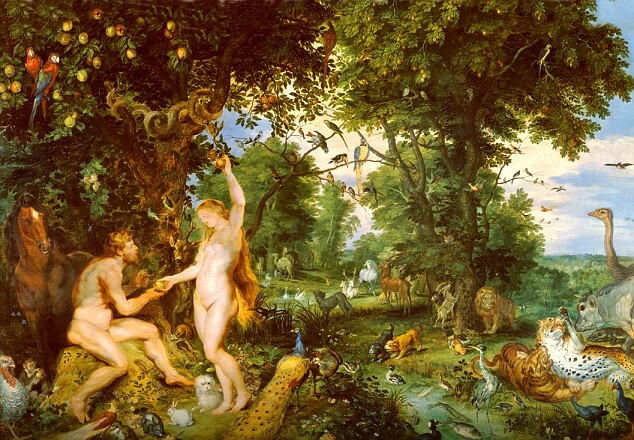 Seen in this way, the Eden story, in Genesis, tells us of humanity's innocent and leisured hunter-gatherer past, when we could pluck fruit from the trees, scoop fish from the rivers and spend the rest of our days in pleasure. But then we 'fell' into the harsher life of farming, with its ceaseless toil and daily grind. And we know primitive farming was harsh, compared to the relative indolence of hunting, because of the archaeological evidence. When people make the transition from hunter-gathering to settled agriculture, their skeletons change - they temporarily grow smaller and less healthy as the human body adapts to a diet poorer in protein and a more wearisome lifestyle. Likewise, newly domesticated animals get scrawnier. This begs the question, why adopt farming at all? Many theories have been suggested - from tribal competition, to population pressures, to the extinction of wild animal species. 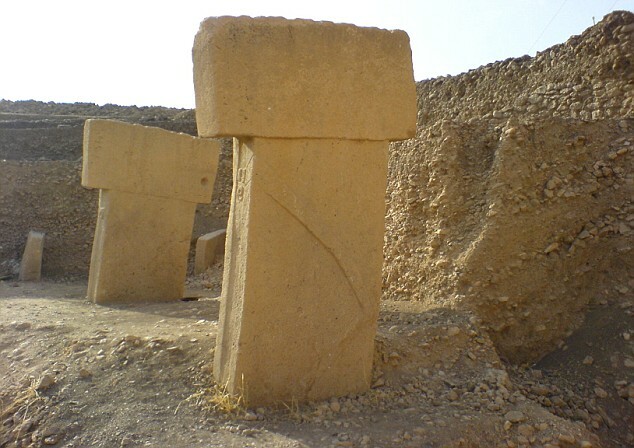 But Schmidt believes that the temple of Gobekli reveals another possible cause. 'To build such a place as this, the hunters must have joined together in numbers. After they finished building, they probably congregated for worship. But then they found that they couldn't feed so many people with regular hunting and gathering. The reason such theories have special weight is that the move to farming first happened in this same region. These rolling Anatolian plains were the cradle of agriculture. But there was a problem for these early farmers, and it wasn't just that they had adopted a tougher, if ultimately more productive, lifestyle. They also experienced an ecological crisis. These days the landscape surrounding the eerie stones of Gobekli is arid and barren, but it was not always thus. As the carvings on the stones show - and as archaeological remains reveal - this was once a richly pastoral region. There were herds of game, rivers of fish, and flocks of wildfowl; lush green meadows were ringed by woods and wild orchards. 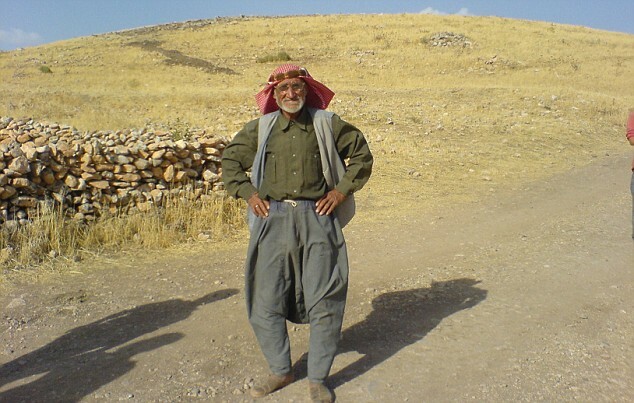 About 10,000 years ago, the Kurdish desert was a 'paradisiacal place', as Schmidt puts it. So what destroyed the environment? The answer is Man. As we began farming, we changed the landscape and the climate. When the trees were chopped down, the soil leached away; all that ploughing and reaping left the land eroded and bare. What was once an agreeable oasis became a land of stress, toil and diminishing returns. And so, paradise was lost. Adam the hunter was forced out of his glorious Eden, 'to till the earth from whence he was taken' - as the Bible puts it. Of course, these theories might be dismissed as speculations. Yet there is plenty of historical evidence to show that the writers of the Bible, when talking of Eden, were, indeed, describing this corner of Kurdish Turkey. 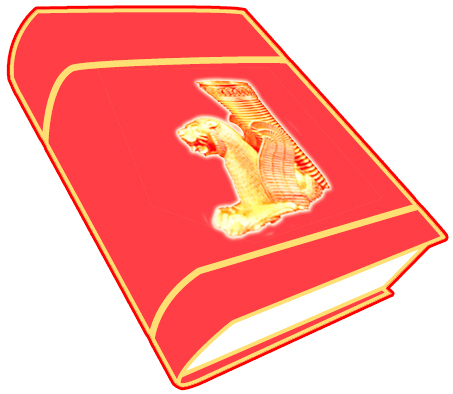 In the Book of Genesis, it is indicated that Eden is west of Assyria. Sure enough, this is where Gobekli is sited. Likewise, biblical Eden is by four rivers, including the Tigris and Euphrates. And Gobekli lies between both of these. In ancient Assyrian texts, there is mention of a 'Beth Eden' - a house of Eden. This minor kingdom was 50 miles from Gobekli Tepe. Another book in the Old Testament talks of 'the children of Eden which were in Thelasar', a town in northern Syria, near Gobekli. The very word 'Eden' comes from the Sumerian for 'plain'; Gobekli lies on the plains of Harran. Thus, when you put it all together, the evidence is persuasive. Gobekli Tepe is, indeed, a 'temple in Eden', built by our leisured and fortunate ancestors - people who had time to cultivate art, architecture and complex ritual, before the traumas of agriculture ruined their lifestyle, and devastated their paradise. It's a stunning and seductive idea. Yet it has a sinister epilogue. Because the loss of paradise seems to have had a strange and darkening effect on the human mind. A few years ago, archaeologists at nearby Cayonu unearthed a hoard of human skulls. They were found under an altar-like slab, stained with human blood. No one is sure, but this may be the earliest evidence for human sacrifice: one of the most inexplicable of human behaviours and one that could have evolved only in the face of terrible societal stress. Experts may argue over the evidence at Cayonu. But what no one denies is that human sacrifice took place in this region, spreading to Palestine, Canaan and Israel. Archaeological evidence suggests that victims were killed in huge death pits, children were buried alive in jars, others roasted in vast bronze bowls. These are almost incomprehensible acts, unless you understand that the people had learned to fear their gods, having been cast out of paradise. So they sought to propitiate the angry heavens. This savagery may, indeed, hold the key to one final, bewildering mystery. 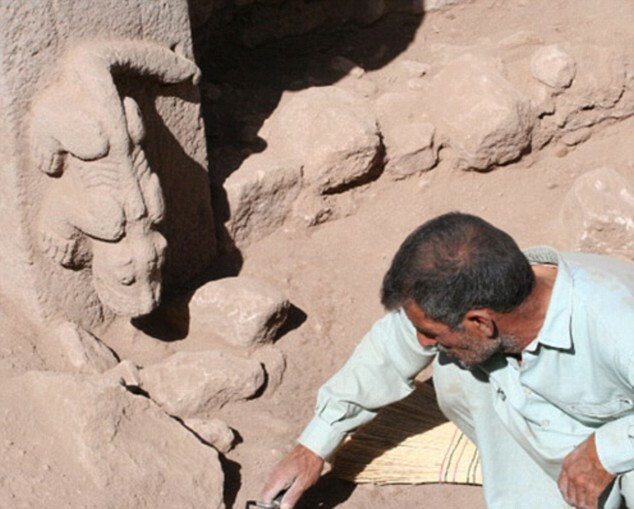 The astonishing stones and friezes of Gobekli Tepe are preserved intact for a bizarre reason. Long ago, the site was deliberately and systematically buried in a feat of labour every bit as remarkable as the stone carvings. Around 8,000 BC, the creators of Gobekli turned on their achievement and entombed their glorious temple under thousands of tons of earth, creating the artificial hills on which that Kurdish shepherd walked in 1994. 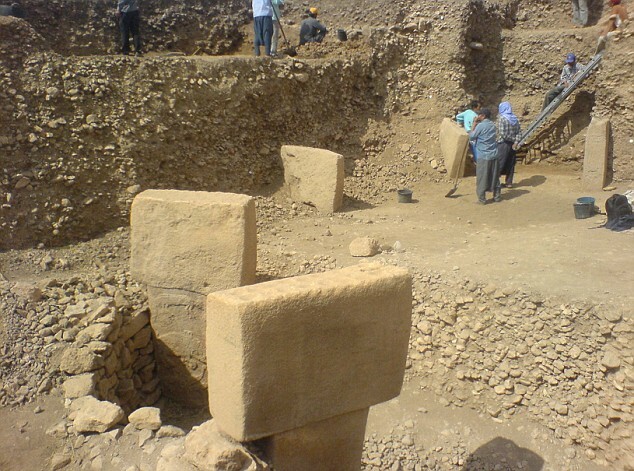 No one knows why Gobekli was buried. Maybe it was interred as a kind of penance: a sacrifice to the angry gods, who had cast the hunters out of paradise. Perhaps it was for shame at the violence and bloodshed that the stone-worship had helped provoke. Whatever the answer, the parallels with our own era are stark. As we contemplate a new age of ecological turbulence, maybe the silent, sombre, 12,000-year-old stones of Gobekli Tepe are trying to speak to us, to warn us, as they stare across the first Eden we destroyed. The Genesis Secret by Tom Knox is published by Harper Collins on March 9, priced £6.99. To order a copy (P&P free), call 0845 155 0720.